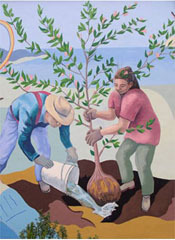 Fortes’ paintings have been exhibited in California, Nevada, Chicago, New York, Hawaii, Venezuela, Japan, and Norway, and are held in numerous private collections, as well as at the Asian American Art Centre in New York, the Nevada Museum of Art in Reno, and the Triton Museum of Art and Crocker Art Museum in California. In 2004 Fortes was awarded a Joan Mitchell Foundation Painters and Sculptors Grant. He has received numerous other grants and honors, including grants from the Sacramento Metropolitan Arts Commission, and a Visual Artist Fellowship from the California Arts Council. 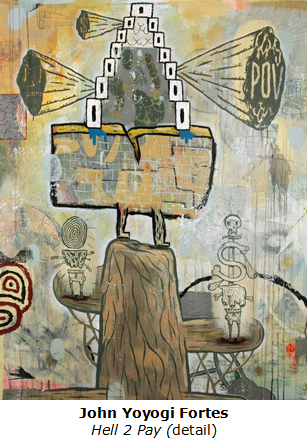 Fortes was also nominated for the Alliance of Artists Communities, Vision from the New California Project in 2006 and 2007, and his work was included in the International Arts & Artists traveling exhibition, Infinite Mirror; Images of American Identity. on closing Sunday, June 26, at 4 pm. Fortes is also a videographer and has collaborated with the California Association of Museums and the Crocker Art Museum in Sacramento, producing videos of Bay Area artists Travis Sommerville and Mel Ramos, and Austrian artist Gottfried Helnwein. Currently he is working with the Crocker Art Museum on their Block by Block initiative based on community engagement and various projects with the California Endowment. Join in the fun at the June 3 reception by making some art of your own for our Community Art Project, titled Coastal Colors. We provide the panels and the paints, and will display your creations in our East Gallery foyer. Sanchez Art Center is located at 1220 Linda Mar Blvd in Pacifica, about a mile east of Highway 1. Following opening night, the galleries are open Friday, Saturday, and Sunday, 1–5 pm, and by appointment, through June 26. For more information call 650.355.1894.